This cup is similar to the smooth cup 22 oz but is ribbed on the sides. It is the taller version of the 16 oz fluted stadium cup. 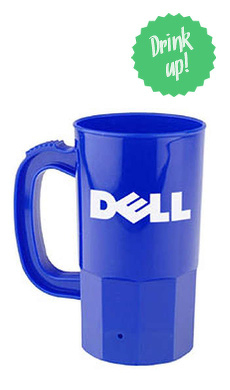 It is great for holding a large beverage and promoting your company. Your logo can be imprinted on both sides and in one color. The multiple color options make it great to match any sports team or occasion you may be attending. This plastic cup is durable and will stay in your hand easier with the ridged design ensuring this reusable cup will last. Proudly made in the USA, this recyclable cup is constructed from FDA approved materials and includes stadium cup color of your choice with 1 color printing. Imprint Area: 2.75 in. x 3.5 in. Everything was good. Will order again next time. We received our cups yesterday! They look great. Can't wait to use them in our fundraiser tomorrow. Our church is raising money to build water wells in Sub-sahara Africa. So glad I found you guys on the web. Do you do coffee cups?